Currants are quickly becoming some of my favourite shrubs. They are interesting to prune and its even more fun to watch the results: big, juicy fruit. I always look forward to making fresh red currant vinaigrette for my garden-fresh spinach and lettuce. In addition to their usefulness as a food, I appreciate the various currants for the impact they make in my garden, with their interesting branch structure and beautiful berry display. If its fruit production that you’re after, red currants are high maintenance. But its worth the work, and if you enjoy pruning, as I do, you won’t mind pruning these plants twice per season. In summer, prune each new lateral shoot to 5 leaves near the end of July. Leave the leaders alone at this point. After harvesting, in late fall or winter, cut back all new leader growth to about 3” (or the closest bud). Cut all summer-pruned laterals back to one bud. Remove any dead, diseased, or broken branches as well. When you prune, think about the overall shape and framework of the shrub, pruning to buds that face in the direction you want the branch to travel. Generally, I prune to outward facing buds. 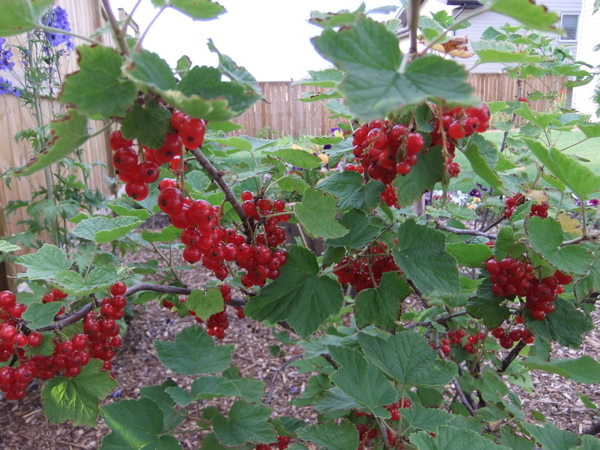 I bought four red currants at a going-out-of-business-sale a few years ago and knew almost nothing about the plants at that time, since they generally fall out of the realm of ornamental plants. I was warned that they were prone to aphids. That warning was correct. Red currants become infested with aphids, while everything else around them is fine. The first year I sprayed the leaves with a neem-based product with poor results. Next I went straight for the Malathion, which worked very well. There was a small resurgence in the aphid population a couple of weeks later, but to a lesser degree. Last spring, I tried a soil applied systemic insecticide in late May, and I had absolutely no aphids on any of my plants all season long. This is the treatment I recommend, but beware the pre-harvest interval for using such chemicals, so as not to consume pesticide residues. If you’re not a fan of insecticides, try insecticidal soap, and be prepared to spray weekly. Also, I have had reports of foliage damage after using insecticidal soap. So far, my plants have been disease-free. After realizing that red currants do not make the most beautiful landscape shrubs, I moved some from my ornamental garden to somewhere near the compost, for educational and fruiting purposes only. Two of the transplants suffered the following season and new growth eventually started to die back. But the new shoots looked healthy. So I pruned out the transplanted shoots, left the new ones, and the plants look fine. The point: I believe that renovation to grade should be okay on older plants due to the vigorous nature of red currants. Prove me right or prove me wrong, then let me know. My red currants are surrounded by about 4” of mulch and I top it up as it degrades. The soil stays moist beneath the mulch and I rarely need to water (once last season!) Moist, well-drained soil is preferred. I fertilized my currants with 20-20-20 the first season. Last season I used a combination of humic acid mixed with mycorrhizal fungi. This season, I’m adding a product called KelpGro (an organic Kelp based fertilizer from BC) to the mix. This is a low maintenance shrub, best planted in an area large enough to accommodate its mature form (5′ x 5′), and left alone. This really is a multi-season ornamental plant, with a great flower display, interesting and edible berries, and often beautiful fall colour. It is also native to Alberta, very hardy, and insect and disease resistant. A great choice for a Prairie shrub bed. Overgrown shrubs can be reinvigorated in a manner similar to lilacs, tatarian honeysuckle, or cranberries. I have mixed feelings about alpine currant. I first learned about this species in college and my plant instructor mentioned that it can be used in topiary (ie. pruned into interesting shapes). It was years before I found a specimen healthy and vigorous enough to use for such a practice. Old, overgrown rows or specimens can be cut back hard to a few inches above grade. New shrubs will regenerate. Do not over water these plants or they will die. Their native habitat is dry, windy, alpine slopes. They cannot tolerate “wet feet.” I know, I nearly killed a few plants one year by direction the downspout from the house in their direction. They only started coming back two years later!